Lots of great things happening on the Paradise Recovered front today. First up, Brown (UPS) dropped off a fresh batch of Paradise Recovered DVDs at By the Glass Headquarters in Bedford, IN! This marks the first confirmed sighting of the Paradise Recovered DVD in the wild. Thanks to our wonderful distributor, Monarch Home Entertainment, the discs look and sound fantastic. The new DVD includes a commentary track featuring myself, Writer/Producer Andie Redwine and stars Heather Wallis and Dane Seth Hurlburt. In addition, there is a short documentary on the disc called Beyond Paradise, which features interviews with some of the world’s foremost experts on cults and mind control. The DVD officially releases April 24th and you can pre-order now HERE at Amazon and/or add it to your DVD queue HERE on Netflix. We’re also really excited about a certain guest blog post that went live today. The highly esteemed Matthew Paul Turner invited Andie to write a post for the fantastic Jesus Needs New PR site. Have you been spiritually abused? This is for you… Even if you have not, please read and share this awesome post! In which I use my trusty iPhone to capture the festivities at the World Premiere of Paradise Recovered. I’m back in Indiana. Back where it all began in the summer of 2009. After hitting seventeen film festivals in the last year and winning numerous awards, Paradise Recovered is ready for it’s official public unveiling. Tomorrow, November 20th, we’re premiering Paradise at the historic Buskirk Chumley Theater in Bloomington, IN. The fact that we shot a scene in the Buskirk makes our premiere there extra special. For more information on the screening, visit our official Facebook Event page here: http://www.facebook.com/events/271219359583929/. To buy tickets to the show, CLICK HERE. As part of the premiere, we’re also releasing the Official Motion Picture Soundtrack for Paradise Recovered. The soundtrack features fantastic music from Indiana artists like Cara Jean Wahlers, Jookabox, Sardina, The New Old Cavalry, Salaam, newcomer Evan Slusher and more. As part of the big event at the Buskirk, Cara, Evan, Salaam and The New Old Cavalry will be performing live before and after the screening of the film. I’m still amazed at the awesome soundtrack of Indiana artists we were able to assemble for this soundtrack (thanks in large part to the fine folks at Musical Family Tree). We’ll be selling the soundtrack at the premiere and it will be available from retailers like CD Baby , Amazon and iTunes next week! In conjunction with all this, we’ve been busy editing a DVD extra for our upcoming DVD release. The extra is a short doc that we’re calling Beyond Paradise. The piece features interviews with world renowned thought reform experts like Steve Hassan of freedomofmind.com and counselors from Wellspring Retreat and Resource Center. If you didn’t know, Paradise Recovered has pledged 10% of our profits to Wellspring, a one of a kind facility that counsels victims of spiritual abuse and cults. So I hope to see some of you at the premiere tomorrow. I’ll post pics and hopefully some video from the event soon. And look for our Paradise Recovered DVD to be released in early 2012! It’s been a busy couple of months. Here are some of the highlights. 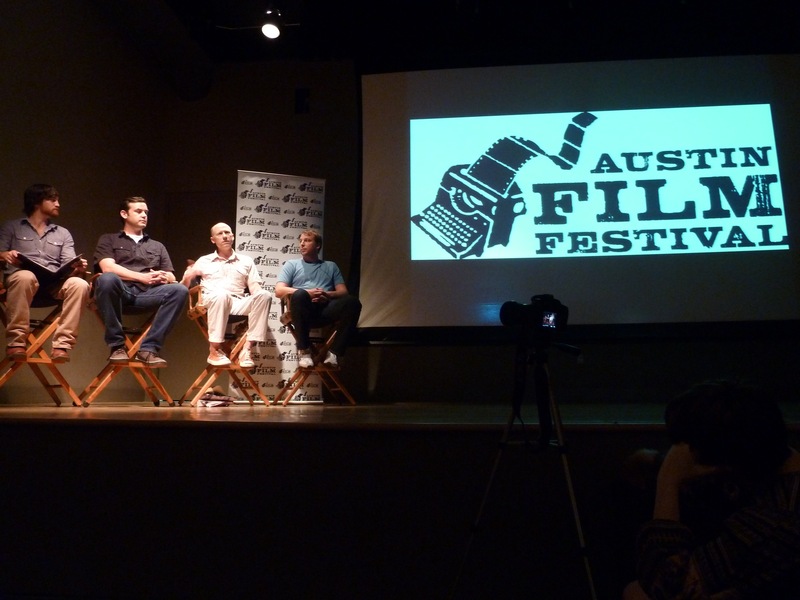 I sat on a Conversations In Film panel presented by The Austin Film Festival. The panel was titled Making Your First Feature and I got to participate with some fantastic fellow filmmakers. 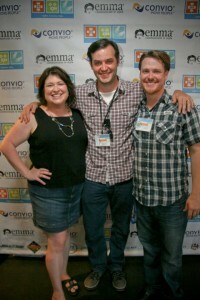 We talked about our experiences making our first feature films. 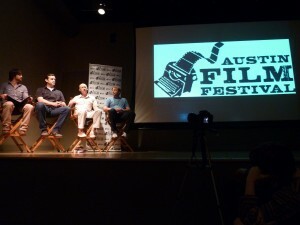 It was a lot of fun and I enjoyed learning from and meeting the other directors on the panel. Paradise Recovered played the first ever Van Wert Independent Film Festival. 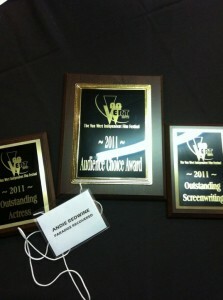 Writer/Producer Andie Redwine had a great time at the fest and brought home some nice awards. 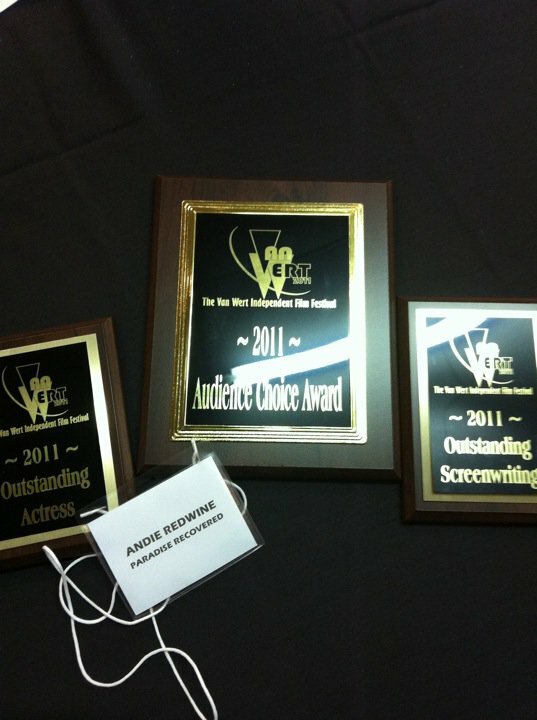 Paradise Recovered won the Audience Award, Best Screenplay and Best Actress (Heather Wallis). So that was very cool. Speaking of Wellspring Retreat and Resource Center, on August 5th-7th Andie Redwine and I journeyed to Athens, Ohio to help Wellspring celebrate their 25th anniversary. On Friday the 5th, we screened Paradise Recovered for a packed house at the lovely Arts West Theater in Athens. 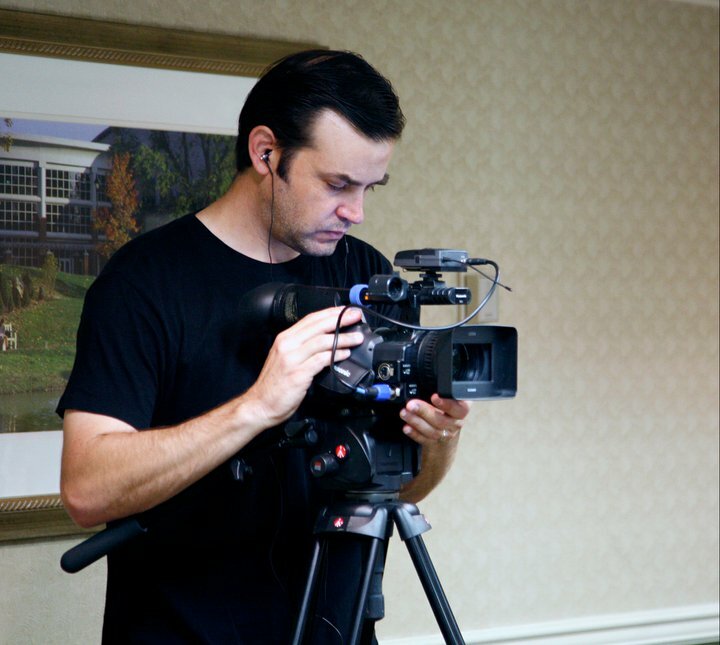 Then on Saturday, we volunteered to videotape the internationally renowned cult experts that Wellspring had speaking at their Conference on Cults. Needless to say, I learned a ton (It was a fitting end to a great weekend when we heard that Warren Jeffs was sentenced to life in prison for his crimes against the young girls growing up in the FLDS). I traveled to Ohio via Indianapolis, where I had the chance to visit with my good friend Alphonso Bailey. Bailey is a former professional boxer who runs a really cool Prison Ministry called Down But Not Out. DBNO teaches character building workshops in prisons and juvenille detention centers. Alphonso has a great life story; a former college athlete, he was arrested for some armed robberies and served two years in a Kentucky prison. On the 4th, I got to visit a prison with him and him in action. I love the way he brings hope to these guys living behind bars. He really believes in them and believes that their lives can change and get better. He is always inspiring and I hope to bring his story to the screen one day. And finally, while in Indiana I got to shoot a bunch of stuff with the new Canon XF100 camcorder. It’s a pretty amazing camera that shoots 50 mb/s 4:2:2 video with a full set of pro features and it’s the size of a palmcorder. We were shooting test/reel footage for a spec project that we’re keeping under wraps for now. But I highly recommend checking out the XF100 if you shoot doc style run and gun stuff. It’s brilliant. Paradise Recovered still has several film festivals coming up. And Andie will be at the Central Florida Film Festival over Labor Day Weekend! Come and say hi if you’re in Iowa or Florida.